What makes Endeavor so special? – Endeavor is the only front wheel trike conversion kit that will fit virtually any motorcycle. All common steering geometry settings can be fine tuned to fit the riders preferences. Caster, Camber, and Toe. Endeavor is patent pending in 148 countries and first to market with this one of a kind “Universal Conversion Kit”. Endeavor has gone through R&D and testing on 5 unique motorcycles logging over 140,000 miles without issue. Truly a matter of time tested and proven technology. Endeavor was voted “Invention of the year” in 2014 by the Minnesota Invention Congress and also awarded a first place gold medal in Engineering at the 2014 INPEX show. How much does it cost? – Normal pricing is $9200 – $9600 for all conversions. This includes all parts, labor and paint – paint is color matched to the motorcycle including pinstripe and two tones. All work is done at our production facility in New Prague MN and each unit uses our common proven modular frame design. The body style and finish is custom so each build is unique in character. The advantage to this is you get a premium ride and a design that fits your bike and your tastes. Build progress photos are sent weekly or even daily as things are updated. You have an active part in each phase of the build and are provided the opportunity to tweak the design to your liking. What motorcycles will it fit? – This kit is designed to be of a universal fit. The Endeavor frame design is patent pending in 148 counties. The spit frame design allows us to use our modular sections to fit virtually any motorcycle. Most common conversions right now are GL1500 and GL1800, Victory, Kawasaki V-twins, Valkyries and Harley, but this is just a small sample. How wide is the finished wheelbase? Does it lean? – No it does not lean, while most major companies have investigated the leaning concept and even secured patents on them there are no plans to mass produce any leaning trikes. Simple physics do not support any advantage to a trike that leans. Cornering is not improved, balance is not improved, braking also is not improved and you are faced with all the negatives of a two wheel motorcycle except now you have that 3rd wheel to maintain plus you just paid 10K for something that does exactly what your 2 wheel motorcycle did. 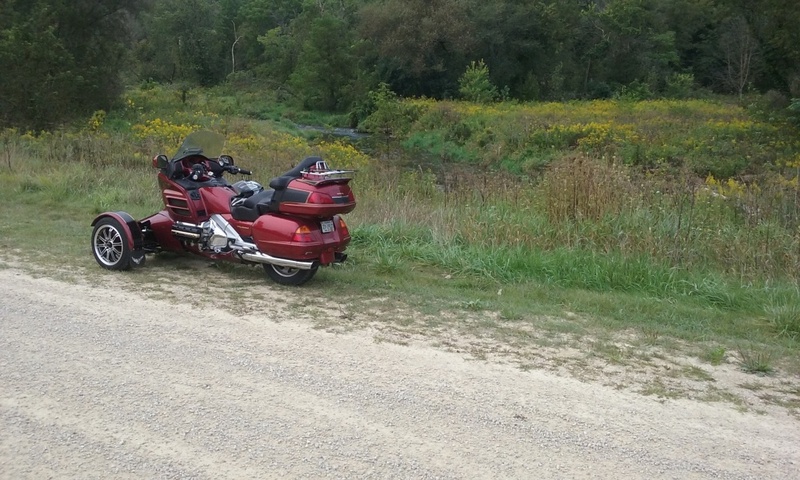 A non-leaning trike will out handle most stock motorcycles and is more fun and “adventurous” to ride. A non-leaning trike can go anywhere on any road surface under complete control. No ground clearance problems, improved cornering, improved braking, and complete control in gravel or any other unpaved sport riding condition. Ride the highways all day then pull off onto some desolate minimum maintenance road and experience the true back country without limitations, Perfect for those with fly rod in hand. 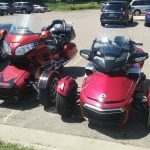 Endeavor trikes are not ordinary trikes they are sport trikes designed specifically for those who wish to advance their riding skills to another level. How does it compare to a CanAm Spyder? Like the Spyder and 99% of all vehicles neither leans and both are specifically designed around steering and handling. 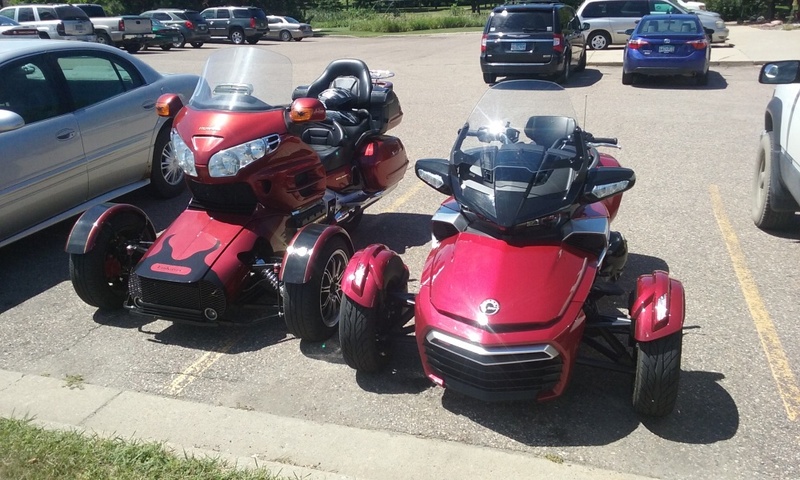 Both offer a true sport ride and both will out handle any 1-2 designed trike. In general BRP builds a factory wheels forward trike and I convert existing motorcycle to a similar design. Unlike the Spyder the Endeavor kit allows you to use your choice of base motorcycle to achieve a superior and sporty ride. If you like the Spyders you will fall in love with Endeavor. How does it compare to a 1-2 type trike? – To be honest there is no comparison. 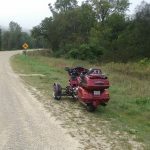 While both the wheels front trike configuration and wheels back trike configurations share the flat cornering non-leaning advantages a wheels back conversion uses a steering system which is designed specifically for a bike that leans. The caster is extreme and non-adjustable and it still uses a single hard motorcycle wheel up front. The end result is difficult steering and uncomfortable ride experience. The wheels forward trike configuration on the other hand is designed specifically around steering and handling and I believe offers a more adventure laden aspect to motorcycling as the front wheel trike configuration is very well suited for more rugged and sporty activities. The wheels forward trike configuration is what makes this a true “sport trike”. How well does it corner and handle side winds? – In most cases the front wheel trike configuration will outperform the original 2 wheel setup. With just a small bit of practice cornering speeds can be higher and safer. Some tour bikes like the GL1800 are greatly affected by side winds in their native 2 wheel state but once converted side wind effects are greatly reduced. Twisties are a complete blast on these things! What about cooling features? – On the air/oil cooled models we add a 14″ thermostatically controlled fan (standard inclusion). Also air scoops are added to direct air right to the engine where it is needed. On the Harleys I add an oil cooler as standard equipment also. On liquid cooled models we may relocate the radiator and in some cases we add an extra radiator to increase cooling efficiency. On the GL1800 a 3rd radiator is standard and will eliminate any possibility of engine overheat. What about storage space? – Our kit includes a storage compartment up front (1.5 – 2 cu ft) big enough for full face helmet, jackets or misc items. 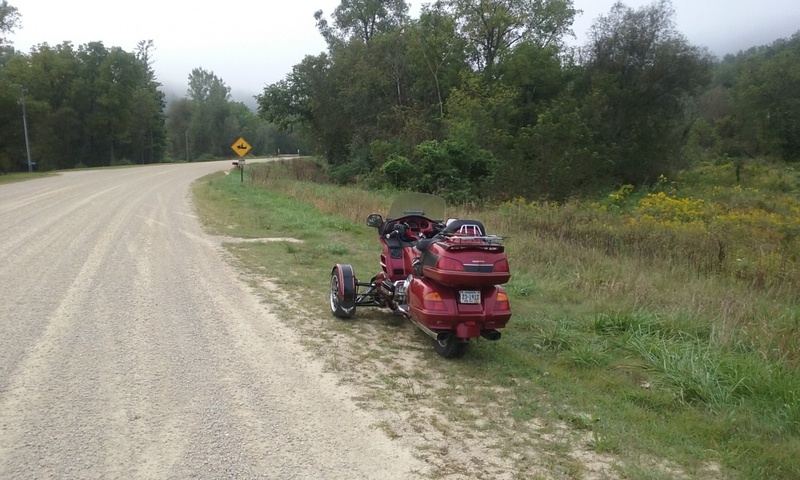 This is more storage than is available on a conventional trike setup as you don’t lose your saddlebags rather actually gain storage space.Also pulling a trailer is much easier and safer with this type of trike design due to its inherent stability and improved braking. Well everything is included in the price, All materials, labor for installation and custom fabrication along with a professional color matched finish. I also let the owner suggest a body style so each Endeavor is unique and personal. All this at a fixed price. Can I install the kit myself? – Currently due to liability issues that is not an option. Update 2/15/2015 – Officially taking orders for new builds as our R&D and final tuning is complete. For information regarding orders and custom builds please use our contact us form. We are in full production now and are taking orders. We are located in New Prague MN in the local NAPA building. Updated 11/7/2015 – All our frame units are now powdercoated and all final body finish is being performed by a high quality professional body tech. All A-arms are custom designed and built in our shop. Updated 2/18/2016 – New steering radius configuration allows tighter turn radius of 20 feet so one can do a full U turn curb to curb, Locks added to hood as standard, new larger volume front master added for even better tire squealing brake power. Update 7/1/2016 – All units to carry the 1Z tag as our SportTrikes will go from 1 to Z to infinity regarding versatility and rideability. Paved, unpaved even dirt road are no problem. Update 8/1/2016 – Spindles, brake calipers, rotors and subframe now fully powdercoated and front grill dipped in sealer for added longevity. Colors now also a free option on calipers and rotors for added custom look. 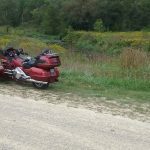 Update 8/20/2016 – Now an oil cooler is standard equipment on all Harley Davidsons.